A lot of words have been written about King 810 over the last 5 years and no doubt many more will be written in the future. The problem with this is that people are quick to write about who King 810 are rather than what they are. With the story of the band and their background taking priority over their music, often at the detriment of the band. King 810 are a powerful force of nature. One that is brutal and unflinching whilst also being thoughtful, poetic and dare I say it soulful at times. The real strength lies in the music itself which is an ever evolving beast, from the pure brutality and raw nature of the band’s debut Memoirs of a Murderer to more experimental dark jazz tinged moments on the bands sophomore release La Petite Mort or a Conversation with God you never truly know what to expect from a King 810 record. Suicide King opens with the line “How can we give them something new that’s serious but entertaining too” as Heartbeats kicks in to gear. It’s an interesting question that poses an even bigger challenge, but it’s one that King 810 and David Gunn in particular seem more than up for accepting. This is a very rich and layered album that adds many new strings to the band’s already impressive bow, dark trip hop beats meshed with those crunchinf riffs we know so well create an uneasy sonic landscape. The all out aggression and primal rage of their earlier work has been replaced with a more deliberate and restrained tempo leading the more explosive moments have a greater impact when they do hit. This is no more evident than on the two opening tracks the aforementioned Heartbeats and Braveheart both of which hit like juggernauts when required but also give the listener enough room to fully take in their respective lyrical content and themes. Whats gotten into me, Black Rifle and God is Watching really showcase the more stripped down vibe that this album has at the heart of it, they all rely almost entirely on looped beats and electronics, but they fully allow Gunn the room he needs as a vocalist and a storyteller to paint his pictures and each instrumental perfectly accompanies his words without ever overshadowing them, giving this album a real collection of memorable tracks to hinge itself on. King 810 are one of the most diverse and interesting bands in the metal world and one that displays a real artistry to what they are doing. 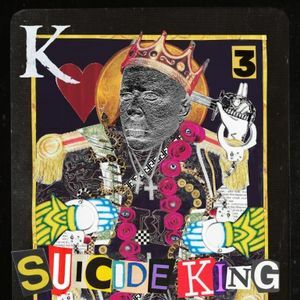 David Gunn is a thought provoking and considerate artist who isn’t afraid to experiment and move outside his comfort zone, Suicide King shows his maturity and growth as an artist and ends up being his most accomplished work to date.